In poverty and other misfortunes of life, true friends are a sure refuge. The young they keep out of mischief; to the old they are a comfort and aid in their weakness; and those in the prime of life they incide to noble deeds. 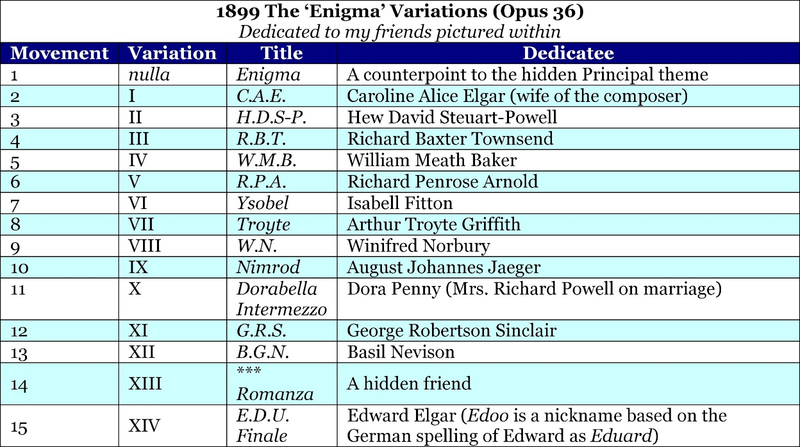 The Enigma Variations by Edward Elgar harbor three perplexing mysteries. The first is a covert principal Theme that may be played "through and over" the whole set but is not heard. The second is a cryptic "dark saying" concealed within the Enigma Theme. The third concerns the identity of a secretive friend portrayed in Variation XIII. Each variation has a set of initials or name for a friend “pictured within” except for Variation XIII. In the place of a nickname or initials, Elgar places three asterisks and the subtitle Romanza. 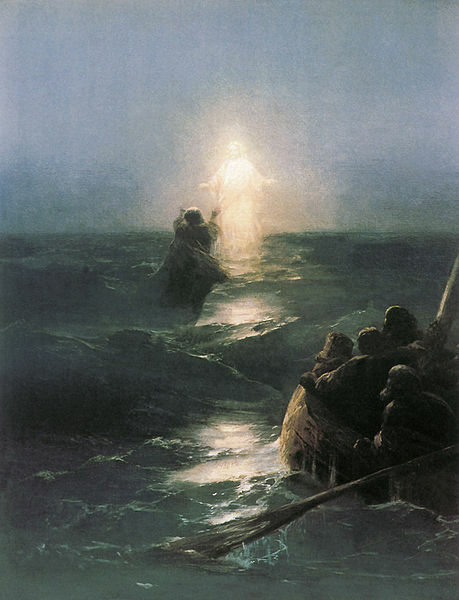 It should be apparent that he did not wish to disclose the person pictured within this movement, presenting a distinct parallel with the missing Principal Theme. The most popular theories regarding the identity of the missing dedicatee center on two individuals. The first and more prevalent is Lady Mary Lygon. She was an aristocrat who served as a choral conductor, educator, committee member of the Worcestershire Philharmonic, and organizer of a music festival at Madresfield Court. In a letter to critic Joseph Bennett, Elgar characterized the Worcestershire Philharmonic as “a sort of toy I suppose for a petulant child.” The local community was acutely aware of Elgar’s maturing ambitions and artistry, establishing the Worcestershire Philharmonic as a vehicle for him to conduct own works alongside those of other well-known composers. The second is Helen Weaver, his first fiancée who terminated a nine-month engagement in 1884 and moved to New Zealand for health reasons. The inability of scholars to coalesce around any candidate demonstrates the issue is far from resolved, assuring the dedicatee of Variation XIII remains shrouded in mystery. The most prevalent theory claims Lady Mary Lygon as the hidden friend, but a glut of inconsistencies make that view untenable. The earliest sketch simply identifies Variation XIII with only the capital letter L instead of the initials L.M.L. Elgar’s comments for a set of 1929 piano rolls states the “...asterisks take the place of the name of a lady who was, at the time of the composition, on a sea voyage.” Contrary to that claim, Lady Mary was not on a sea voyage during its composition. The score was completed February 21, 1889, and she did not depart for Australia until April 11, 1899. To suggest his recollection of the timeline was clouded by the passage of time is contradicted by at least two earlier sources. In a letter dated May 2, 1899, he wrote of this variation, “The pretty Lady is on the sea & far away…” In Ernest Newman’s 1906 biography he explains it “refers to a friend who was crossing the ocean when the Variation was written.” Three of Elgar’s long standing friends—Rosa Burley, Ivor Atkins, and Ernest Newman—rejected the idea she could be the secret friend. Some suggest Elgar refused to acknowledge Mary Lygon because he could not secure permission in time for publication. Alice’s diary documents Mary Lygon visited their home on the same day the score was sent to Richter’s agent, allowing ample time and opportunity to secure permission if that had been his actual intention. Prior to her departure, Elgar secured permission to dedicate Three Characteristic Pieces to her, and there is no reason to assume he could not have also done so for Variation XIII. As Turner astutely observes, there is absolutely no evidence he sought permission for any of the variations. Given the confusion surrounding the hidden dedicatee, it is surprising no one has argued this too was a jape on the part of Elgar and that none exists. However, there is no reason to suppose that all such identifications were written on the sketches at the time; in fact, Elgar had a habit of keeping and annotating his sketches years later. One may compare, for example, the sheet of paper containing sketches dating from 1903–4. It starts with a theme for the projected ‘Cockaign no. 2’, to be entitled ‘City of Dreadful Night’; following this are two sketches, one of which became part of the Second Symphony. Above it the composer has written, at least six years after he wrote the sketch, ‘Sym II.’ So he might have added the letters ‘LML’ to the sketch of the variation much later, when the attribution was commonly accepted. Given the presence of the capitalized L on the earliest known sketch, it is possible Elgar added the letters ML to the lone L years later when the Lygon theory enjoyed general acceptance. This may have been done as a form of misdirection to maintain the secret identity of the hidden dedicatee. A neologism to describe this unsubtle deception is “missdirection.” Another possibility is he was alluding to the Roman numerals with L representing 50 and M for 1000. The significance of these numbers and potential literary parallels lead to one of the great epic poems of Italian literature, Dante's Divine Comedy. It is often suggested Elgar was reluctant to identify anyone with a variation having the unlucky number thirteen. This misunderstanding is discredited by early sketches in which the Roman numeral XIII was assigned to B.G.N. The Enigma Theme is actually the first variation since it is a counterpoint to the covert Theme. The final version B.G.N. appears with the Roman numerals XII, so this early association is preserved because B.G.N. is the thirteenth movement in the series. In other words, it is still the thirteenth variation even though it is assigned the Roman numeral XII because the Enigma Theme is essentially the first variation in the series. …As to myself the following are F A X about me. Just completed a set of Symphonic Variations (theme original) for orchestra – thirteen in number (but I call the finale the fourteenth because of the ill-luck attaching to the number). I have in the Variations sketched portraits of my friends – a new idea, I think – that is, in each variation I have looked at the theme through the personality (as it were) of another Johnny. Elgar clearly dissociates himself from the unlucky number thirteen, yet paradoxically that is the precise number of friends he portrays in Variations I through XIII. As Variation XIV is the Finale and a musical self-portrait, he does not count it among his friends. This safely accounts for his confusing comment about thirteen variations because he elaborates by explaining they are portraits of his friends. The names for twelve friends are known, but the identity of thirteenth remains shrouded in mystery. The selection of twelve with the name of thirteenth kept secret is very symbolic in Elgar’s weltanschauung. Like the covert Theme and the "dark saying," the thirteenth friend’s name and initials pose yet another secret in cipher. 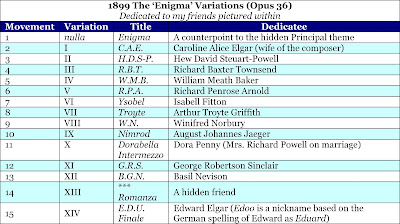 To learn more about the secrets of the Enigma Variations, read my free eBook Elgar’s Enigmas Exposed. Cited from the notes of the Aeolian Company’s 1929 ‘Duo-Art’ piano rolls of the Enigma Variations. Elgar, E. (1991). Edward Elgar: Letters of a Lifetime. New York: Oxford University Press, USA, p. 122. Reed, N. Elgar's Enigmatic Inamorata, The Musical Times, Vol. 125, No. 1698 (Aug., 1984), p. 430.